Following on from our previous set of midfielder rankings, we have come back to once again bring to the fore the best young midfielders in Europe. While there has been considerable competition in the last few weeks leading up to the international break among many of the top teams, the tables are slowly sorting themselves out. The same goes for the players. A week’s good performance isn’t really enough to propel a star to the top of individual charts, and only the ones that are consistently the best are finding themselves near the top of the charts. That being said, let’s dive straight in. Dropping down the ladder at an alarming rate is Ousmane Dembele. The starlet had a bright start to his career in Germany, but the last few weeks have seen performance dovetail a bit. His playing time has taken a slight hit, as has his productivity on the field. He’s facing competition from the other youngsters in the squad, like Passlack and Pulisic, and for Dembele, the international break comes at a good time. With the sort of talent he has though, any of the Best Betting Websites would have him as staying on this list, and indeed, rising up it. Right above him on the list are two newcomers to the list. Both Naby Keita and Leandro Paredes are defensive midfielders who’ve made it onto this list on the back of impressive recent performances. Neither has really cemented their place in the first XI of their respective clubs, but both look well on their way to doing so. Next on the list are the two Monaco boys. 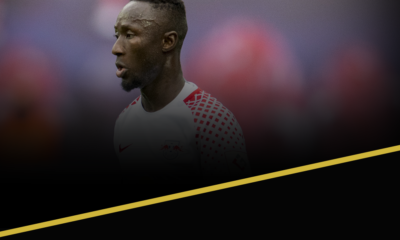 Monaco seem to be bringing through a really exciting generation of young players, and are challenging close to the top because of the performances of these players. Which means, for us, and any young player enthusiasts, Monaco is the team to watch. 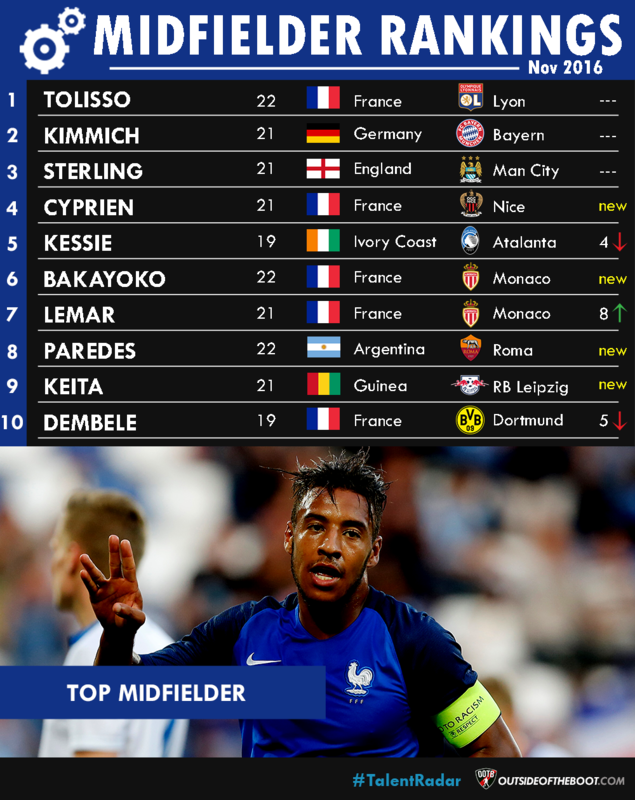 Thomas Lemar, the tricky and pacy winger, has moved up 2 places in the rankings after some fine performances. He’s even earned a France call up for this international break, and that is a fine achievement for the youngster. Just above him is Tiemoue Bakayoko. Bakayoko has shown throughout the season that his energy and ferocity in midfield can serve as a great platform for the attacking talents in his team like Lemar. Up above them, and more or less keeping his place on the list is Franck Kessie. The Atalanta man has continued his good form in the past month, keeping up his energetic performances in the middle of the park. The guidance of Gian Piero Gasperini has really taken the club and the player to great heights. Kessie, nominally a defensive midfielder, is the top scorer, and Atalanta, normally a mid table side, are in the top 5 at the moment. Along with him, is a man who has grown to be a vital part of Nice, the unlikely leaders of Ligue 1. Wylan Cyprien has made quite a splash in the talent pool that is Ligue 1, with his performances earning him a consistent spot in our Team of the Week feature. If Nice are to continue their unlikely title challenge, then they will need their players to continue performing at a high level. Cyprien is young, but as he has shown, can definitely be a great asset for his side. As stated at the very beginning of this article, it is consistency that sets our picks apart, and with that in mind, we have the same top 3. Sterling and City have had a difficult time grinding out results of late, but that isn’t a stain on their performances. For all the struggles with points, they’ve had some great results too. The win against Barcelona was a great moment for City, and Sterling was quite effective on that night. The same can be said of his performances across this period. Like Sterling, Kimmich too has personified his team, growing in confidence under Carlo Ancelotti, and slowly adapting to the new manager’s demands. Kimmich had a great summer with Germany, and has continued the form into the season. His performances across the field, whether at wing back, or in the midfield, and drawn comparisons with legendary German player, Phillip Lahm. And keeping his spot at the top of the pile is Corentin Tolisso. The young midfielder has kept his performance levels up as Lyon have sought to move higher up the table in Ligue 1, and perform in Europe as well. 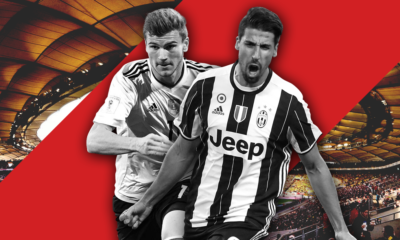 The latter quest has certianly been more successful, as they escaped Turin with an impressive 1-1 draw against Juventus. Despite the slightly rocky start to the season, Lyon and Tolisso have shown that they can be contenders, and a surge of form for his team will put them right back in contention.